The Galaxy Watch is a great match for any Android phone, especially since you can easily make it your own. Not only can you choose from a number of watch faces, the watch bands are easily replaceable to better match your style, since the 46mm Galaxy Watch uses standard 22mm watch bands. Here are the best replacement bands for the Samsung Galaxy Watch 46mm! This strap from V-MORO is made of heavy duty stainless steel, and it can go on in an instant with the built-in clasp. It's available in black or silver to better match your watch, and it can be installed with the quick-release pins. This band will definitely help you stand out from the crowd, with the red sandalwood in between each link. You can get this band in either black or silver steel, and both look great with the red wood. There's a clasp to get the band on and off your wrist, and quick release pins to join the band and watch. These stretch watch bands are my personal favorite because they're super easy to slip on and off, and they're the perfect fit. You'll likely need a jeweler's help to get that perfect fit, but it's worth it. This one from Speidel comes in either a straight end for easier installation or with a curved end to better match the contours of your watch. Few things are as classy as a nice leather watch band, and this one from Berfine is plenty stylish. It comes in black, brown, or dark brown, and it'll fit your Galaxy Watch perfectly. You get a heavy metal buckle and lighter stitching, so your watch pops even more. If you prefer thinner leather — or just want to save a few dollars — this band from Fullmosa is great as well. You can choose from 10 different bands and buckle color combinations to best match your style, and there's an included installation tool to get the band on your watch. The buckle is heavy metal, so it'll be nice and sturdy on your wrist. This band from EACHE is still leather, but a bit different style than the other picks. There are 14 different bands and buckle color combinations that'll fit your Galaxy Watch, and all of them will look great. There's no visible stitching along the sides of the band. Instead, it's closer to where the band attaches to the watch. The Galaxy Watch comes with a silicone band so it can be used when you work out, but this band is going to be a little better. 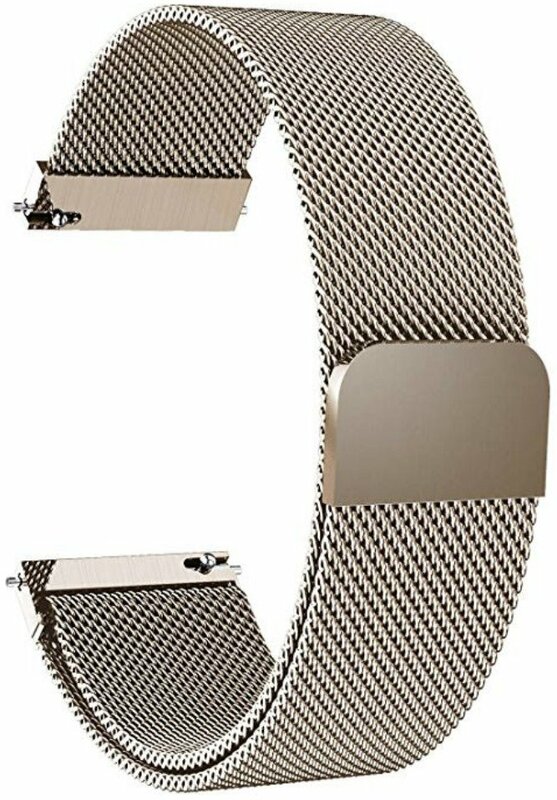 There are more perforations on the band, so your wrist will breathe a bit easier. More perforations also mean a more exact fit, definitely important if you're monitoring your heart rate. The strap comes in nine different colors, and there are bundles if you want to get multiple colors. If you want a watch band that won't budge, you want a NATO strap. This one from PBCODE is made of heavy-duty nylon, and it comes in eight different colors. 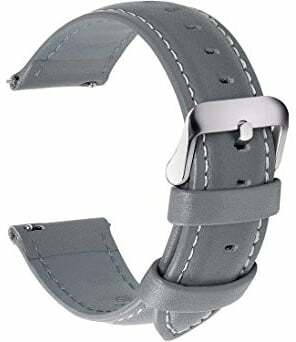 The only buckle color is silver, so keep that in mind if you want one for your Galaxy Watch. If you want to swap out different bands to change up your style, this set from CIVO is for you. You get four straps of different colors and patterns, and there are 15 different bundles to choose from. The kit includes an installation tool, and a few replacement pins to keep the bands attached to your watch. This sleek band has a magnetic closure and a streamlined look, as well as a quick-release switch so you can change on the fly. There are six colors to choose from and the band is 9.25 inches in total length, and easily adjustable thanks to the simple closure. Barton Elite's bands come in 16 colors, many of them two-tone, and they're made from a firm but flexible silicone. Each band comes with two lengths of the side with holes, so most people should find the perfect fit. These gorgeous bands come in 17 colors and have accented white stitching, as well as quick-release switches so you can change them up easily day to day. If you're into the sophisticated look with a splash of color and a comfortable fit, then definitely check out these bands. No matter what your style is, it's easy to find a replacement band for your Galaxy Watch. The watch takes standard 22mm straps, so any band that size will also fit your watch. And since watchmakers have used that size for centuries, it shouldn't be hard to find the perfect watch band for you. If you're looking for a great mix of comfort and style, check out the Civo NATO bands, since you get four options in one pack for a very reasonable price.